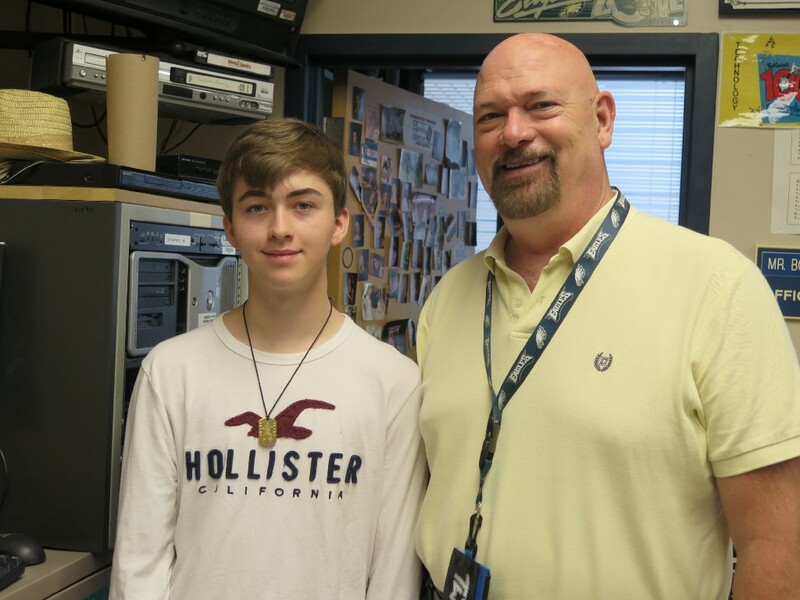 Special to The Sun: WTHS senior Tom Copsetta posed with the school television production teacher Marty Bouchard, who started the WTHS television production course 34 years ago. For some high school students, multitasking includes listening to music while doing their homework. For others, like Tom Copsetta, multitasking is taking classes at Rowan College at Gloucester County in an effort to earn his associate’s degree before graduating high school. 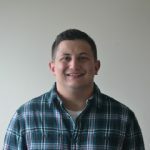 Copsetta received information for RCGC’s High School Option Program, the program that would allow him to take college courses while attending high school, from his parents who thought it would be a good idea for him to get ahead of the curve and potentially save some money. Per the RCGC website, to be eligible for HSOP one must be over 15 years old and have completed their freshman year of high school in either public, private, or home school. There is a discounted rate for students in Gloucester County. Copsetta said his high school guidance counselor, Linda Salkowski, was blown away when she heard what he was doing. Little did he know the video he made would be a huge success and make him the face of the program. Copsetta’s drive and determination led him to graduate from RCGC before he graduated high school with a 3.94 GPA. He will also take part in RCGC’s inaugural 3+1 Program which will allow students to take another year of classes at the county college that will transfer directly toward a bachelor’s degree at Rowan University. At the age of 17, Copsetta is halfway toward earning a bachelor’s degree in radio, television and film. Despite having a background in those three areas, he wants to focus more on the television and film aspect. He draws his inspiration from his friends, films and YouTube. One of his sources of inspiration is Rowan alumni, Jesse Ridgway, who has a YouTube channel with more than 3.5 million subscribers. Another source of inspiration are big movies that have their own universe, like “Star Wars” or “Harry Potter.” Copsetta said it would be awesome to create a universe like the “Wizarding World of Harry Potter” one day. He is very thankful for having Bouchard as a teacher and mentor.